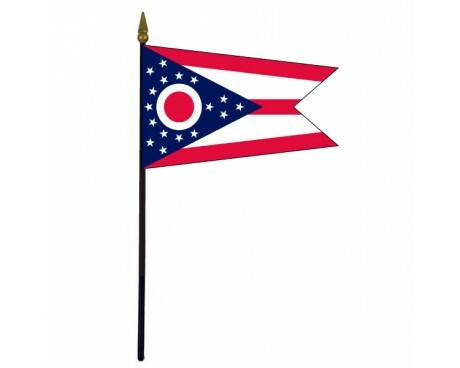 The state flag of Ohio can easily be distinguished from all other state flags in the United States. It is the only state flag to have a broad pennant shape, which would make it one of the most unique flags in the United States even if it did not also have an unusually distinctive pattern. Ohio state flags have five horizontal stripes of red and white that stretch out from a blue triangle that is arranged along the hoist. The triangle contains a cluster of seventeen white stars along the hoist and a smaller group of four stars near the triangle's peak. The triangle also includes a red circle with a white border. The entire flag has a pennant shape rather than the rectangle that characterizes every other state flag. The red, white, and blue color scheme reflects the colors of the national flag. The state's connection to the rest of the country is also emphasized by the cluster of thirteen stars, which represent the original thirteen colonies that formed the United States. The smaller group of four stars brings the total number to seventeen, which represents Ohio's place as the seventeenth state to join the Union. The "O" shape is a reference to the state's name, and the five stripes represent Ohio's hills and valleys. Ohio state flag history does not extend as far back as the history of the state because Ohio went without a state flag for almost a century. It began with the Pan-American Exposition of 1901, which included an area that displayed a flag for each state in America. An architect named John Eisenmann designed the flag, which was originally intended to represent the Pan-American Exposition Commission of Ohio rather than the state itself. It was adopted as a state flag in 1902. The bill was approved without controversy, but the flag remained unpopular because many people believed that the national flag should take priority over state flags during displays. It has become more popular over time, and now it is a common sight in Ohio. The flag itself has never been changed, but the state legislature did create the most recent entry into the Ohio state flag history when it authorized a specific procedure for folding the flag in 2005. 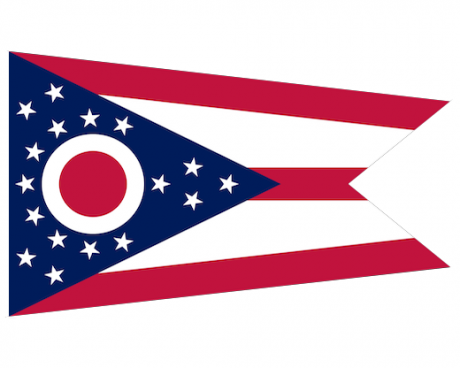 Ohio is the only state not to have a rectangular flag. It adopted the pennon-shaped flag on May 9, 1902. The pennon was used by the cavalry between 1862 and 1865, and in 1901 was designed by John Eisenmann. A pennon is extremely different from a pennant by ending in a swallow-tail shape. The states nickname was used long before the buckeye was confirmed as the state tree in 1953. The design was based on the shape of the tree's seed, and its circular form on the flag could suggest both the "O" for Ohio, and the tree itself. The name of the state is derived from the Indian, and means "beautiful" river. Mr. Eisenmann designed the flag to represent the roads and rivers of Ohio. The number of stars, as in many other flags, indicates the position held by the state in its joining the Union, in this case being seventeenth. In 1788 the first settlers arrived in Ohio, and it became part of the Territory ceded to the U.S.A. in 1783. It was then part of the Northwest Territory, and became a state on March 1, 1803. 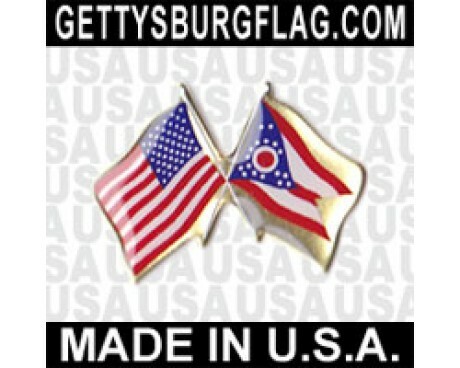 Looking for another flag to accompany your Ohio flag? 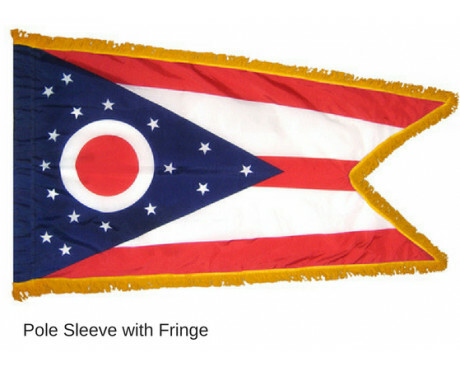 Browse our American Flags and Historical Flags for some options that will nicely complement your new OH flag. 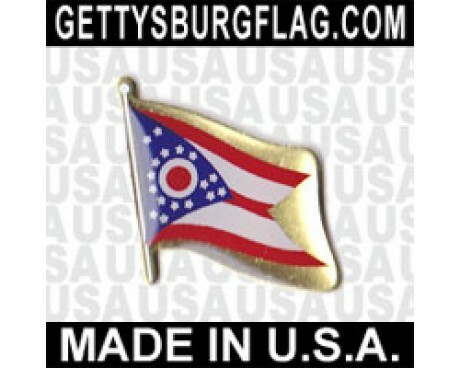 Need a way to display your Ohio flag? 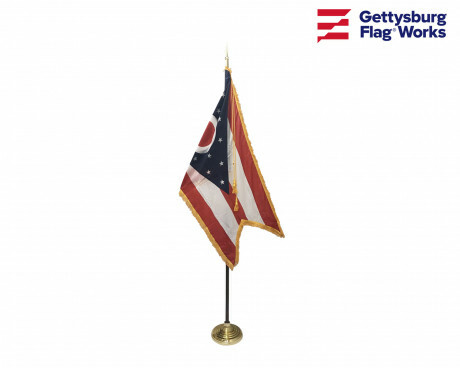 At Gettysburg Flag Works, we also carry flag hardware, in-ground flagpoles, and wall and post mount flagpoles. Order everything you need at once to make installing your Ohio flag easy! Have questions or can't find the Ohio state flag you are looking for? Give us a call at 1-888-697-3524 or contact us online and we'll be happy to assist you! Interested in browsing other US state flags? You can find flags for all the United States here!